Katalon team is excited to announce huge updates of Katalon Studio version 5.5 which will help your testing project much easier than ever before! The latest release includes the updated Web Recorder which now can provide users the ability to continue recording existing test cases to minimize the hassle of re-recording long and complex tests. You now can also edit test cases during recording and run test steps in the Recorder interface as well as merge and override test objects after recording. Beginner Friendly: More sample projects have been added to the public Katalon GitHub repository. You can select those sample projects as soon as you access the welcome page of Katalon Studio app, together with useful tips and tricks to maximize your test efficiency. Share Custom Keywords: You now can utilize the Import/Export Keywords feature in Katalon Studio 5.5 in order to share your custom keywords within the team or with the community. Extend Web Service’s object: The Web Service object’s view had been enhanced to let you execute the verification snippets on the fly. 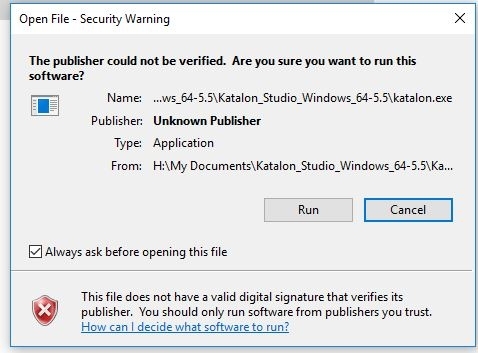 Please refer to the Release Notes and download Katalon Studio 5.5 for free here. I click on “Run” and the splash screen opens but nothing else happens. Eventually the app goes to Not responding and I have to kill with Task Manager. I’m using version 5.4 on the same machine with no issues.